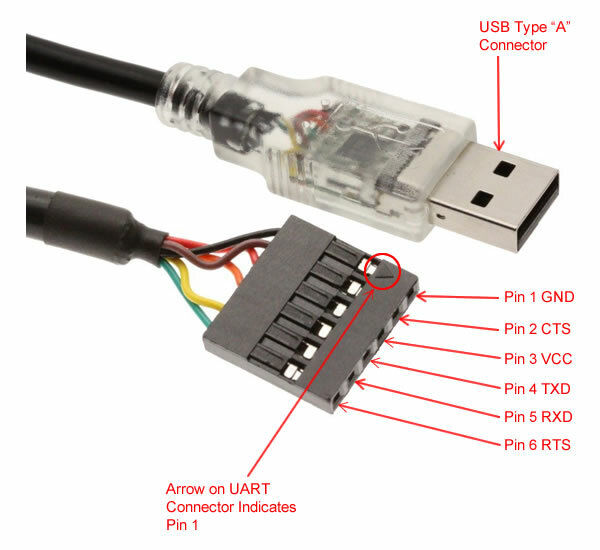 The 5 foot Serial UART USB to 3.3v TTL PIN Header Cable (TTL level) adapter allows you to connect your computer through the USB port and use it as a regular serial communication device with support for 7 or 8 data bits. All USB protocol is handled within this adapter using an FTDI Chip set. There is no other device or programming required. 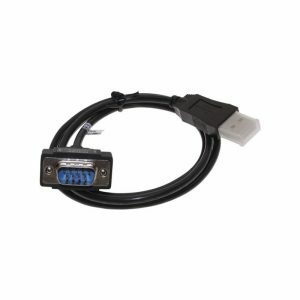 The USB to 3.3v TTL PIN Header Adapter Cable is perfect for embedded systems that require a serial connection to a computer and provides a USB to TTL Serial interface to 6-pin header. The board attaches directly to the USB bus via a standard type A receptacle connector. It shows up on any Windows computer as a standard serial COM port. Any applications that talk to this COM port is automatically converted to USB and back to UART on your target board. This worked for various devices, including ones with only TX, RX, GND, and VCC headers. If RTS and CTS aren’t present on your device’s TTL header, simply don’t connect them. Also recommend not bothering to connect VCC. I got this cable because of it’s RTS and CTS pins as well as being equipped with an FTDI chip and I definitely got what was in the description. Tested out on my JP1.x remote that needs the RTS line in addition to the usual TTL line – hence why I chose this cable over a cheaper 4-pin – and it works flawlessly. Build quality on first impression is good and looks to be on par with other well made cables but ultimately time will tell. As far as all the comments about no pin out information included with the cable, I can only assume the issue has been rectified as the PDF on the included driver/manual disk has a slew of information including the very valuable pin outs that happen to be exactly the same (color and pin location) as the genuine FTDI brand cable. What I was shipped does not have a clear over-mold as shown on the Amazon Website. The plastic molding on my USB connector is quite dark—almost black. Nevertheless the green TX LED and the red RX LED are quite visible. I bought three of these to use under MS Windows 7 and Linux. I’m going to buy more. For example. this device is useful for monitoring the console serial port on a Beglebone Black and/or Raspberry Pi. The latter requires an “adapter” cable. The price of this device is better than the equivalent cable from FDDI and the function/quality is identical. In fact, because the cable diameter is not as thick, I like it better than FTDI’s. Used it to fix a Netgear R6300 wireless router. It was a convoluted process, the instructions to reload the firmware on the reference website were confusing at one point (pin connection) but it worked as advertised once I figured out the wiring issue. I bought this on recommendation from the DD-WRT and Tomato forums after I managed to brick my new Netgear router. This cable was recognized by my Windows 8 laptop (if it doesn’t work on one USB port, try another one on the computer; mine didn’t work on the USB 3.0 port, but worked perfectly on the USB 2.0 port). This worked perfectly with a MinnowboardMAX. Pay attention as to which pin is pin 1 (the one with the black wire, which is ground). I needed a FTDI driver for Windows (a web search for “FTDI drivers” will find them), and I used RealTerm (freeware on Windows) to view the output. Really nice to have this well made 3V3 serial adapter. It works well and easily configures into a port and stays there. Love that it lights up to show that there are messages going across the wire. This worked as intended. This actually helped me save my router from the soft-bricking I caused by not paying attention to instructions…. And now everything works! Would buy-in-an-emergency again! Pros: +Easy to re-wire to fit your specific needs Cons: – Couldn’t find any! This is a solid interface to the FT232R chipset for bit bang mode. Tested on OS X with the native operating system driver as a virtual COM port and with the libftdi driver for bit bang mode.